A couple weeks ago we had the honor of attending the 50th Annual SD ADDY awards. You can read about the Ad Fed here. This past year has been an amazing ride. We took the leap to start our own thing and haven't looked back since. It's been an incredibly fulfilling feeling. Every day we get to work with other passionate businesses. We get to help market and brand these companies and we love every minute of it. It feels good to genuinely give back to our community and to build trusting relationships with like-minded business owners. We've been lucky to work with a handful of clients within our first 8 months of The Sampson House and were eager to submit some of our work to the ADDY's this year. We've been proud of the work we've produced, and most importantly our clients have been proud of our work. So, we decided to give it a shot and submit. We spent an afternoon narrowing down our 2015 work to finally agree on submitting 5 different pieces. After a fabulous evening of mingling, dinner, and lots of tiramisu, we took home 5 awards! 1 silver ADDY, 3 Gold ADDY's, and 1 Best of Class award. Holy S*&#...exciting! Last spring/summer we spent a great deal of time re-designing a clean and user friendly website for Coquette Couture. Introducing a new platform and ensuring it be mobile friendly. Our main focus was a clean and white aesthetic while incorporating black and white accents to compliment her logo. We created a highly visual platform with excellent photography to show off her products. The site re-design is refreshing, bright, clean, and an overall happy shopping experience. Lookbook productions are bomb! Especially with Coquette Couture. Our involvement on this project was creative direction, styling, shoot organization, and designing/creating the E-lookbook. 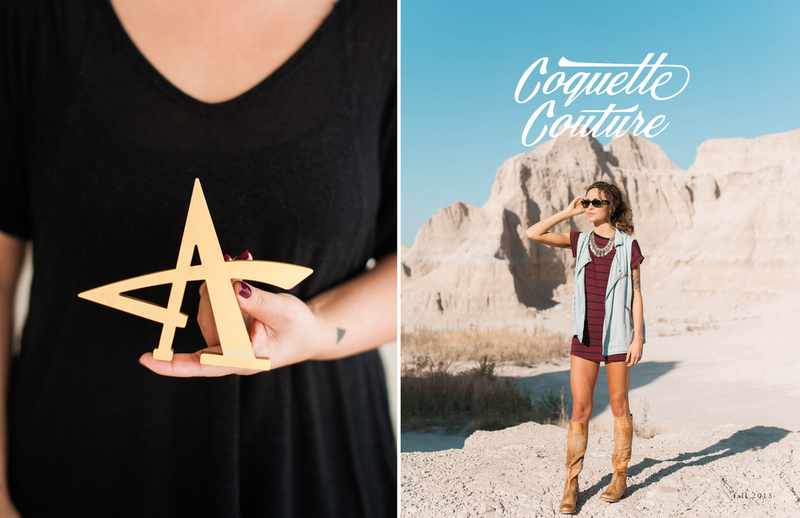 Our focus was to showcase Coquette Couture's personality and brand as effectively as possible. The lookbook is an effective platform to launch her latest trends and gives viewers ideas on how to style any of the Coquette looks. Our A-team consisted of Jeff Sampson Photography, Lacey Mae Makeup, 2 fab models and Coquette Couture. Production day one we road tripped to the gorgeous Badlands of S.D., enjoyed picturesque views and had a killer time. The second half of our production was shot in Tuthill Park in Sioux Falls, S.D. with giant hot air balloons. So. Much. Fun. After the shoot came designing this interactive e-magazine. We designed using clean layouts, visually stunning imagery, and click-through text link to connect shoppers to Coquette's items. Digital Media Management and content creation is what we do best. Day in and day out we focus on creating a brand for our clients that tells their impeccable story, strengthens their brand identity, and we do it on a consistent and quality basis. That is exactly what we've done for Coquette Couture. Last May we took over her Instagram (and Facebook) feed to create 100% all original content that accurately represents her voice. Coquette's voice via Instagram is a variety of content that engages with her followers. Everything from photographing new arrivals, infographics, microcontent, street style images, graphics, sales campaigns, etc. Our elated team from left to right: Milana Arambasic (intern), Valerie Sampson (creative director), Kerry McDonald (art director), and Angela Berry (account director).